If you’re an avid reader of this blog, you know how much I love beauty products from around the world, made with indigenous ingredients. Well, dear reader, I have just discovered a brand from Hawaii that makes my heart skip a beat: Bubble Shack Hawaii. Here’s where you will find soaps, lotions, potions and notions that definitely carry aloha – one sniff and you will definitely feel the love. What makes Bubble Shack special, unique and different? All are vegan, made with Hawaiian spring water, only use essential oils, and are free of sulfates, parabens, phthalates and propylene glycol. 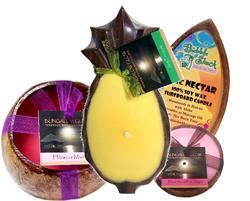 Instead you will products made with Hawaiian goodness, which are adorably packaged and affordable. Nothing in the entire collection is more than $16.99. The price is nice! And if you’re seeking unusual Christmas stocking stuffers, look no further. All are ripe to be picked out – and don’t wait until you’re in Hawaii at the ABC store or at Hilo Hatties to satisfy your craving. You can order over the internet right now (or shop at Bed Bath and Beyond) and give yourself a Maui sensation – and a before-the-trip souvenir – without the trip on Hawaiian Airlines. The soaps are divine. Try the awapuhi, chocolate malasada (doughnut), papaya and Epic Nectar, which is a mix of mango, peach, coconut and mandarin. Each is a thick, succulent slice of paradise that will look gorgeous in your soap dish (and feel even better on your skin). Exfoliating, round loofah soaps contain a special built-in sponge, in aromas that include persimmon-and-papaya, tuberose-and-lilac, and the bestselling pikake lei scent, for a total of 10 types. Lotions will leave you breathless. There’s Epic Nectar, plumeria, and chocolate malasada, to name just a few. These are hand-stirred with Hawaiian oils, plus organic aloe vera and African shea butter. Along with that, there are other silky coconut butter body lotions in fragrances such as Pink Hawaiian Plumeria with orchid and persimmon, and Red Guava with island citrus. You can’t get more exotic than that! Bubble Shack Hawaii also has a sister company called Bungalow Glow, which makes absolutely beautiful candles with 100% soy wax, which is stronger, longer and cleaner-burning than paraffin and beeswax candles. 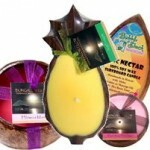 There are reusable poi bowl candles, coconut-shell candles, four-ounce travel tins, and even those shaped like pineapples and turtles. What’s extraordinary here are the 32 – count ‘em – 32 flavorful Hawaiian scents that the candles come in – they’re all like a trip to Hawaii without the jet lag. There’s awapuhi. Banana macadamia-nut pancakes. Hawaiian Waters Ocean Bliss (a bestseller). Kuuaku (tuberose, lavender, lilac and honeysuckle). Passionfruit shave ice. Snowstorm in Kona (Kona coffee, peppermint and Kahlua). And plenty more to astound your olfactory senses. One sniff – and you’ll be convinced too. If you want to smell gorgeous, this is as good as it gets!